I think I get my travel genes from my mom. One of the many days that I was either fantasizing about traveling and/or about writing on this blog, my mom told me that she feels most free when she has a full tank of gas. “Like I can pick up and go anywhere!” Since I live in New York, I can’t really share that sentiment, but I totally got where she was coming from. The idea of being able to explore this big world we live in is exciting and totally overwhelming. Whenever I’m exploring a new location, I can’t help but feel like I’m missing something on each street I don’t choose to turn down (not to mention, the outskirts of town, and the things I hear about when I’ve just returned!). But anyway, that’s a tangent. What I was trying to get to was, much like the way I randomly choose a city I absolutely need to visit, my mom does the same. Luckily, she often invites the rest of us to tag along. This year, she decided she wanted to spend Christmas in Portugal. Lisbon, to be exact. We got to Lisbon at 6am on Christmas Eve. When we arrived, it was still dark out. The cab ride from the airport to our apartment was surreal–the sun was just beginning to rise, and with the sleep deprivation and time difference, it was hard to tell if the day was beginning or ending. But even from those first few minutes, I could tell I’d like this city. The azulejos (the tiles that notably adorn most buildings in the town) are dreamy, and the street art is intense and artistic. It’s a grittier version of most European cities, but still a very safe town, seemingly restoring itself with some hipster charm. We spent our first few days in town preparing for Christmas and acclimating to the time change. Since the Portuguese are predominately Catholic, the town somewhat shut down on Christmas Eve and Christmas Day. 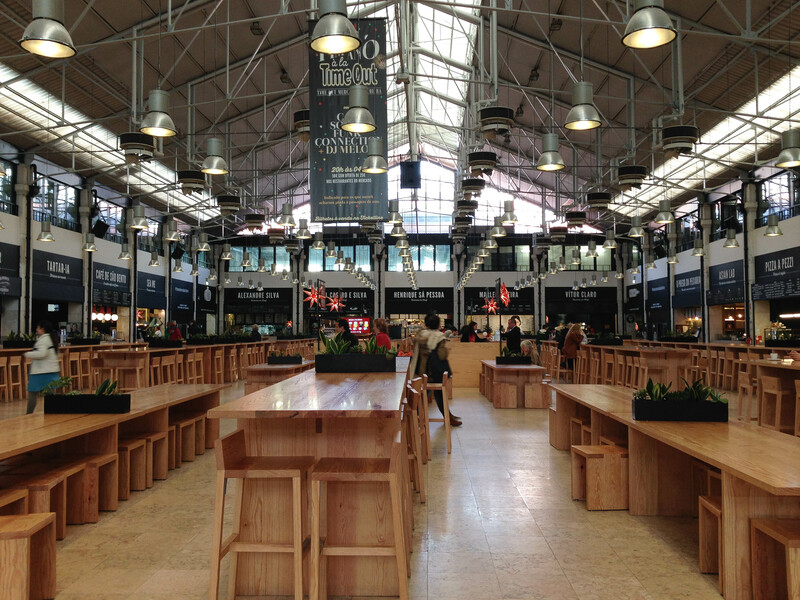 So we spent the morning hours of those days gathering up groceries at the markets (like the Timeout Mercado da Ribeira which is a combination of a typical farmers market and a fancy, Chelsea Market type of set up), stocking up on wine, and strolling aimlessly through the streets. The biggest plus for us? Even though they’re on the euro, this town is affordable. Most apartment rentals are around $100/night or less (ours was about that for 3 decently sized bedrooms, a large living area, full kitchen, and 2 spacious bathrooms). Most restaurants are reasonably priced, and cabs are very affordable. From the airport to our apartment, it was only about $15 USD. On Christmas Eve, we also took a long night stroll from our apartment to the central train station, admiring the Christmas lights around the city and watching all the last minute shoppers gather up their presents. This was just the beginning, though! Stay tuned to learn more about our next 5 days in Portugal. This entry was posted in Europe and tagged city, cool weather, familycation, getaway, romantic, warm weather on January 11, 2015 by laura.